3D printing is one of the hottest topics in technology right now. And while 3D printing isn’t directly related to CFD it is tangentially related to meshing. Therefore, it’s worth noting that Geomagic – makers of software for scan to geometry to manufacturing – will be acquired by 3D Systems – a leading manufacturer of 3D printers, related technology, and the origin of the ubiquitous STL file format. Both companies have been in the news recently. Geomagic announced Geomagic Spark, a new scan-to-CAD platform developed cooperatively with SpaceClaim. The company added haptics to its portfolio. And Geomagic’s founder, Ping Fu, published her autobiography, Bend Not Break. 3D Systems’ new CubeX printer was voted Best of CES by CNET at this year’s consumer electronics show, the company acquired Rapidform (a Geomagic competitor), and their stock had the 2nd best performance of 2012 by rising 271%. As for the relationship to CFD mesh generation, 3D printing devices take as input a mesh (aka tessellation, aka faceted model) of the geometry to be printed, usually in the STL (stereolithography) file format. Therefore, software like Pointwise could be used to go from a CAD model to surface mesh to STL file for printing. We have actually dabbled with 3D printing but in an “edge of the envelope” way. Instead of making a mesh to be able to print the surface, we actually are printing the mesh itself – the lattice comprised of the grid lines. We did this by writing a plugin that inflated each grid line into a tiny, faceted cylinder and then exported all those cylinders to an STL file for printing. (Read more in this blog post from March 2012.) We learned a lot, probably more about the 3D printing agency we used than the technology itself. Primarily, validation of models is a non-exact science. Many times our STL files were rejected for unknown reasons. Secondly, 3D printers apparently can’t handle a model with the number of facets we were sending it. Mesh Flow is a new [it’s at version 1.0] reverse engineering plugin for Rhino which includes point cloud to mesh, mesh to surface, and other mesh operations. The 13th FLOW-3D European Users Conference will be held on 13-14 June in Madrid. Abstracts are due by 28 March. Intelligent Light, makers of the FieldView CFD postprocessing software, launched a major update of their website. Sample free content from the International Journal of CFD. If you’re looking for a nice, simple overview of CFD to share with the layperson or novice, try this PDF from Stanford’s Numerical Methods for Compressible Flows. DHCAE Tools announced a new version of CastNet with improved OpenFOAM interoperability including with BlueCAPE‘s port of OpenFOAM to Windows. Freely available CFD solver TYCHO has been updated to version 1.1 including a full Windows installer. NAFEMS announced the keynote speakers for the NAFEMS World Congress 2013. How Much Does CFD Cost? In an interesting post on the IMAGINiT blog by the recently acquired Informative Design Partners CFD team, there’s a spin on the build versus buy question related to whether you should do CFD yourself or hire a consultant to do the CFD for you. I won’t spoil the rationale [please read the post yourself – it’s brief] but the cost per DIY CFD project is $17,000. Compare that number to the quote provided by your CFD consultant and you have a framework for deciding whether to build or buy. Fluid-dynamics mapping (aka CFD simulation) of the flow around a cyclist and their bike. Image from Wired magazine. You never know how the mainstream media will write about CFD. 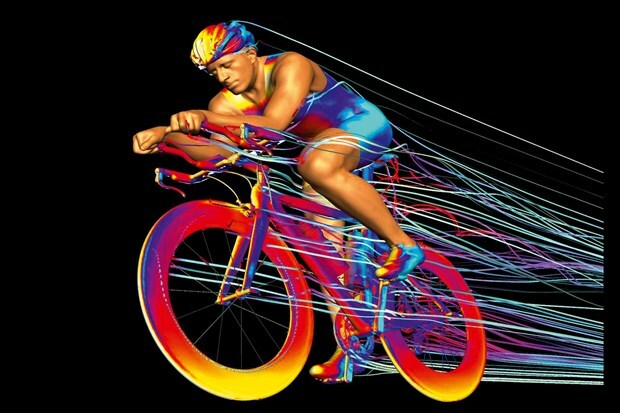 Here it’s “fluid-dynamics mapping” of a sports cyclist. How CFD is making tractor-trailers more aerodynamically efficient. Take at look at SpaceX’s Merlin engine. You can see the winner and runners-up of CD-adapco’s 2013 calendar contest and register to receive a copy of the calendar. The SolidNotes blog describes briefly how split lines in SolidWorks Simulation let you constraint mesh lines to certain locations. GrabCAD leads us to a video of CFD analysis of flow through a perforated plate. Symscape shares this potpourri of fluid dynamics applications. COMSOL shares some postprocessing tips. How to setup and run a CFD simulation for flow over an SAE car body from SolidWorks Simulation. Flow over an SAE car computed by SolidWorks Simulation. This entry was posted in Events, News and tagged 3D printing, 3D Systems, CD-adapco, COMSOL, FIeldView, Flow Science, FLOW-3D, Geomagic, Intelligent Light, Mesh Flow, Rhino, SIMULIA, Symscape, TYCHO. Bookmark the permalink. Happy New Year to you and all those at Pointwise! In regards to the cost of CFD, what are your thoughts? The blog came from a CFD consulting services company so I figure they are trying to sell CFD services on a project level bases. I guess, they will under bid the $17K for a 2 week project. But, I was scratching my head about the whole thing. I couldn’t really figure out how many total labor hrs went into the $48K. So, working backwards, that’s $16K a year (3 yrs), $8K per project (2 per year), and $4K a week (2 weeks per project), and thus $100 per hr (40 hrs per week). That number includes overhead, so lets say overhead is 2:1 (and some would consider that very light if the cost of computers is included in that), so now the number is $50 hr. which can be used for salary. So, the question is, is that for one engineer or two? The blog did mention 2 engineers. The blog did not mention the costs of computers. That may be rolled up in overhead? All together, seems kind of contrived. However, if the total cost was $17K per project, that is about $213 per hr before overhead or number of engineers is included. Given the look of IMAGINiT web page I would guess the overhead is about 2.9 (which is standard for DoD contractors). So that is about $74 an hr. The question is, is that for one engineer or two? Probably somewhere in between. So, their rates seem sort of standard for doing an analysis. In the end, I walk away feeling their cost comparison was kind of odd. If one thinks only about analysis, hiring a CFD consultant will be more efficient, especially if one requires minimum CFD work. And, IMAGINiT are CFD consultants. However, IMO, the big question is who provides the design engineers and/or aero/fluid dynamicists? And, who determines the error bands (in regards to physics modeling) on the analysis? In other words, what’s the probability that the results do not meet the requirements of the customer? Oh, the 2.9 is the whole deal: building, services, admin, training, bonuses, health insurance, sales/marketing, computers, profit, etc. Sorry for all the posts. From here http://www.bls.gov/oes/current/oes_nat.htm#17-0000, the mean aerospace hourly wage is about $50 in the U.S. (Scientific Research and Development Services is about $53). IMO, CFD should still be treated like rocket science. With a 2.9 overhead multiplier that is $145. That’s $11600 for one engineer for a single 2 wk project. I guess that means the customer needs to decide if they would like to use the overhead burden for their own costs or the consultants. Hi, it’s me again! In regards to track-trailer, here is, what I think, is a neat one. http://spinoff.nasa.gov/Spinoff2008/t_3.html. Also, the Wheeler Vortex Generators mentioned in the article are interesting. Here is another link to that. http://www.airtab.com/main.html I’m very skeptical that CFD can analyze an entire array of those when actually in use. OK, it would take A LOT of resources. Yikes! Hi Martin: Sorry for the delay in replying to your comments. Any ROI computation like this is going to be full of assumptions that for any pro forma computation will appear to be contrived. The important thing to me is that they have provided a framework into which someone can plug their own numbers. In the particular scenario they describe, if you’re only doing 2 CFD projects per year you’re probably better off outsourcing that work anyway. Working with the consultant would be your learning experience so that as your needs grow you can bring that work in-house over time. And part of the role of a good consultant would be to provide the expertise and client education to be sure no one’s buying a pig in a poke.